Stine Herbert and Anne Szefer Karlsen, ed. The current economic situation and society’s low confidence in its institutions has suddenly demanded that artists become more imaginative in the way that they organise themselves. If labels such as ‘alternative’, ‘non-profit’ and ‘artist-run’ dominated the self-organised art scene that emerged in the late 1990s, the separatist position implied by the use of these terms has been moderated during the intervening years. 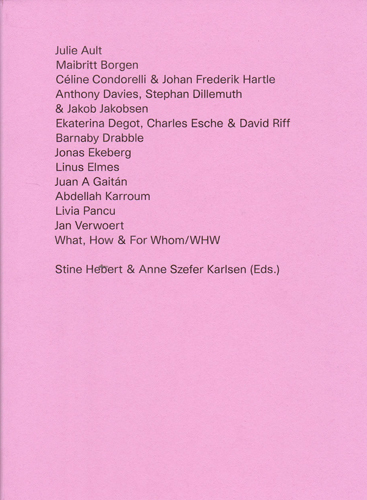 This new anthology of accounts from the front line includes contributions by artists, as well as their institutional counterparts, that provide a fascinating observation of the art world as matrix of interconnected positions where the balance of power and productivity constantly shifts.